To replace, or not to replace— that is the question. Ask anyone born before 1985 to open their mouth and they will look at you strangely, but if you’re persistent you will see a mouth full of mercury or amalgam fillings. For generations, those old workhorses of restoration were used to fill cavities. And they were good. Long-lasting, strong, wear-resistant. Wonderful! Who could ask for anything more? Well, maybe something without a lethal heavy metal? Or perhaps a material that blends slightly better than black on white? If you have a mercury filling in your mouth, you may wonder if having it removed is the right thing to do. I must add that, according to the American Dental Association, amalgam is a perfectly safe filling material. It is outlawed in Norway—maybe they know something we don’t. Hard to say. But it is important to recognize you don’t need to replace mercury fillings simply based on the heavy metal content, unless that is a personal concern for you. We have seen significant improvement in patients’ health following amalgam removal, but correlation does not equal causation. 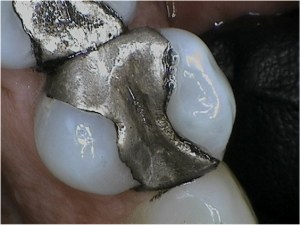 So why should you remove your silver fillings? For one thing, a filling is like a tire. It has a certain lifespan before it begins to fall apart. If you put 80,000 miles on a tire, it will be bald and prone to blowout while you are on the highway, causing you to swerve into an oncoming bus filled with nuns. The same thing happens with a filling. The problem is that there’s not always a good way to find out if a filling has gone sour. Sometimes we will see a problem on an X-ray, or perhaps spot leakage or cracks in the mouth. But often, there are zero symptoms, and no one will know a thing until it is too late. Generally, if you have decay under one or two of your fillings, it is a safe assumption that the others are questionable and you must prepare for a catastrophic cascade failure. Secondly, but no less importantly, amalgam looks horrible. It’s literally the opposite of an aesthetic tooth color. If you have any concern for the way you look, you can quickly improve that with natural white fillings. And, most often, the amalgam removal is covered by your insurance if you have it. Get those cracked, crumbling, leaking heavy-metal fillings examined! It might be time to spruce up your smile and potentially your overall health.